Maastricht, Netherlands – October 29, 2012 – ChemPoint, the leading technology-enabled distributor of fine and specialty chemicals, announced today it has been appointed by IceMelz eco as the strategic distribution partner for IceMelz eco® de-icing applications in Europe. ChemPoint will provide order placement and fulfillment services, and will also provide technical assistance and support. IceMelz eco is a leading company in the field of sustainable de-icers that contribute to a better working and living environment. “We are delighted to start this relationship with ChemPoint in Europe and we strongly believe that ChemPoint its sales and marketing expertise and supply chain excellence will significantly enhance the quality of service to our existing and new customers and allow us to grow sales of IceMelz eco® in Europe”, said René A.M. de Jong, Managing Director, IceMelz eco. “We are honored to add IceMelz eco to our portfolio of highly respected supplier partnerships”, said Dennis Schmeits, ChemPoint’s EMEA Regional Business Director. “Our innovative business model and skilled customer service team ensure that customers are offered the right focus and support for specialty offerings like the IceMelz eco® ”. IceMelz eco® consists of a very active granular de-icing material, which because it is free of any chloride or salt components, is a very sustainable solution for combatting slipperiness as a result of snow and/or freezing. In addition to being environmentally friendly, it is non-corrosive to metals, pet-safe, and non-damaging to vegetation. 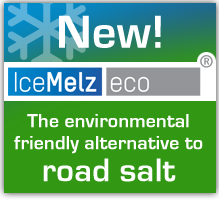 IceMelz eco® maintains its key characteristics at extreme low temperature and dissolves slowly, remaining active five times longer than road salts resulting in a very attractive competitive costing of treated surface per square meter. As the leading technology-driven distributor of specialty and fine chemicals in EMEA, North America, and APAC, ChemPoint.com engages in exclusive product line relationships with premier manufacturers. From its European, Asian, and North American interaction centers, ChemPoint (www.chempoint.com) provides its suppliers with marketing, sales, customer service, and order fulfillment solutions for their targeted customer segments. ChemPoint is a Univar company. With a network of more than 260 distribution facilities globally, Univar (www.univar.com) is a world leader in chemical distribution. IceMelz eco is a Dutch leading company in the field of ecologic sustainable de-icers that contribute to a better working and living environment. IceMelz eco offers a wide range of sustainable de-icers and focuses its scientific capabilities to meet customer demands for ecologic sustainable de-icers. More information about IceMelz eco ’s sustainable de-icer can be found at www.icemelz.com.